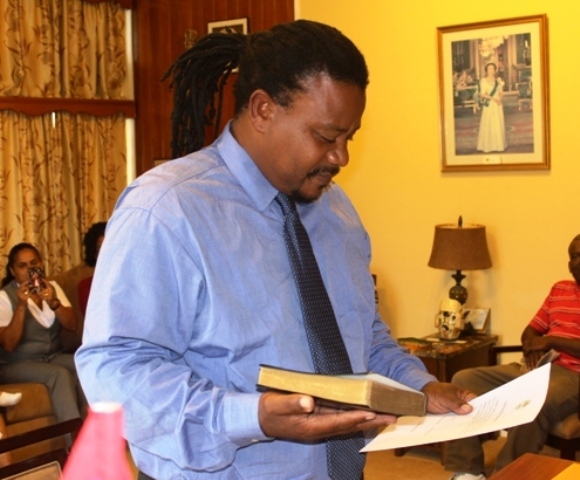 Belize Rural North Area Representative Edmond ‘Clear the Land’ Castro was sworn in today by Governor General Sir Colville Young, as Minister of Transport and National Emergency Management Organization, NEMO. Administering of the oath took place this morning at the Belize House in Belmopan where family and friends gathered to witness the inauguration. Castro was previously the Minister of State in the Ministry of Works, Transport and NEMO and has been instrumental in leading government’s recovery effort in the wake of Hurricane Earl a few months ago. The wicked walk on every side, when the vilest men are exalted……..PSALM…12: 8. This is the same politician that misappropriated money from the airport authority, right? Now lets give him the chance to get his hands on some more. This makes a lot of sense . . NOT.